How to Prevent Ingrown Hair on Bikini line and Bikini Area. Ingrown hairs are hair follicles that have the emerging hair embed inside the skin. They are usually caused by hair removal and regrowth after shaving, waxing or tweezing but can also be caused by friction from everyday activities like cycling and running. Although razor bumps, pimples, redness and skin irritation is common after hair removal they can occasionally result in a more severe infections like cysts which can, in more extreme cases, require surgery. The bikini area is particularly prone to ingrown hairs due to the curly coarser nature of the hair and the delicate skin in that area. Being a lip balm sized roll on it is easy to keep with you throughout the day in your purse or pocket. The Bikini Saver allows you to laser target individual ingrows throughout the day so you can say goodbye to those nasty red bumps! Ingrown hairs on bikini lines are the curse of intimate waxing. As we said the curly nature of pubic hair together with the constant friction of every day life, bikini areas are extremely prone to ingrown hair. 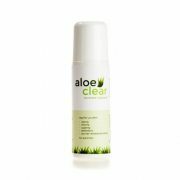 You can however break the cycle of ingrown hairs on intimate areas by daily and frequent use of Aloeclear and Aloeclear Bikini saver. The Bikini Saver allows convenient application throughout the day either to individual ingrows or to the whole bikini area. Being a lip balm sized roll on it is easy to keep with you throughout the day in your purse or pocket. The Bikini Saver allows you to laser target individual ingrows throughout the day so you can say goodbye to those nasty red bumps!